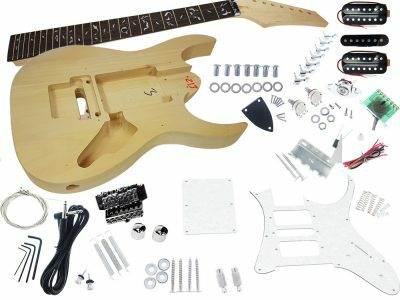 I got this kit and gotta say it’s the quickest guitar you’ll ever build. If you think you can’t…your wrong, if you say it’s too expensive…it’s not. The grain on the body is fantastic and stained up nice with beautiful colors. It comes to you quick, well packed, and with pre-drilled holes and wiring instructions. 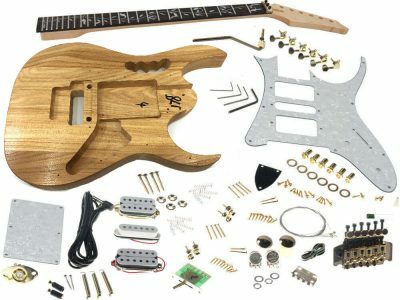 The price is right and it’s the closest thing to an assembled guitar that you’ll ever see. I spent weeks on the finish and 1 hour to build. Pick guard had 3 solder joints and worked great. These kits are great for a beginner or a pro and I’d advise anyone to try it cause of the simplicity of assembly. The body is a canvas for anyone to paint, stain, carve, inlay, or even to personalize to whatever you want. You can do sports teams, cars, names, rock band logo’s, or anything in your imagination! The kit is awesome and the staff at Solo Music is outstanding! Whenever I’ve called, a real person answers, not a machine or canned music, someone you can talk to. Someone who’s knowledgeable about the product. How often do you see that?? If I had more cash now, I’d get the same kit again cause it looks and works great. You’ll need to make tweaks here and there for the string tension and the neck will need adjusting, but follow instructions and you’ll be close. If there’s a question, answers are a phone call away. 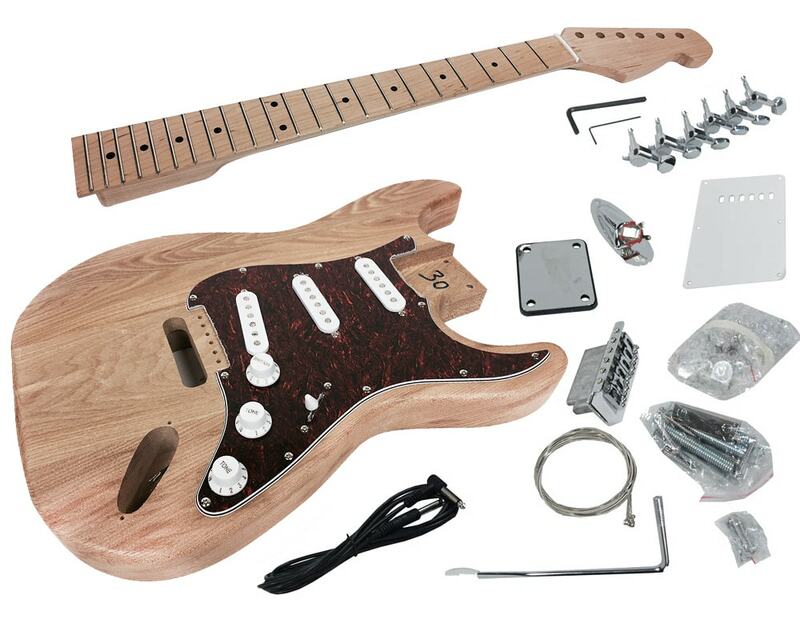 Get one….build it and see…..by the way, I’m a 62 year old drummer with arthritis, and I don’t play a note??? Matt and the staff at Solo Music helped me to set and tune the guitars I’ve built and guitarist’s even say that they play great. You won’t be sorry! I will shop here again and I urge you to do the same if your thinking about a kit. First of all , thank you Matt for the great service ! I love this kit, the wood pattern is amazing and everything fits the way it is supposed to . You could finish it in a few evening. It is really fun to build, so I am taking my time do it perfectly . I am sure I will get another one, I have to choose from a lot of great models ! I will post pictures as soon as I am done. 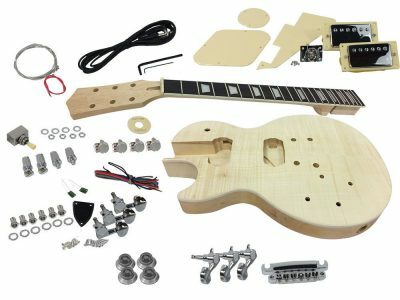 I didn’t understand how much the pickguard/electronics were assembled for this kit – so I put the guitar together much more quickly than I had imagined would be the case. I really like my guitar now that it is together it has a much wider range of “voice” than my Les Paul Jr. and it just feels nice to have “my” guitar in my hands to play. There were a couple of things that the manual could have spelled out better – but if you think (or ask support) these are easy to resolve. If I had to do it again, I would have made more of a mock-up of the body finish before I got going. I used wood stain and tung oil and the result while quite pretty is a tad too red given that the pickguard I was delivered was a sort of reddish brown. It was lots of fun to do it and I am sure there is another Solo in my future …. I just have to wait until my wife buys a new pair of shoes. 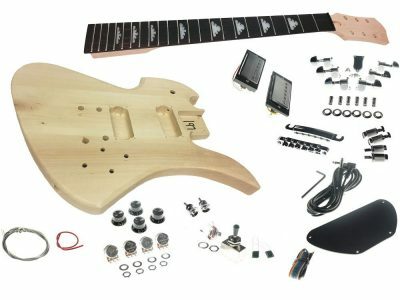 this is my first experience and I don’t have real complains, Service was very good, Matt is a gentlemen, he respond every questions, the quality of the kit no bad, I just do 3 modification, I change the pickups to Wilkinson 60 that I have available from an upgrade that I do a year go, steel tremolo block and the Machine tuners, the one on that came in the kit have lot of play, and even solo was so nicely and offer replacing it if I have problems, I decided to use Wilkinson staggered locking tuners to avoid the trees and it only cost me $28.00. in my guitar the only issue was two holes on the tuner area totally on level so I ended re-drilled. The Neck is the most amazing part of the guitar the grain and the look is just beautiful and the fret work not bad at all, don’t take me wrong you still required to do some work on the fret and the nut but not as much I have to do in my $500.00 guitars. The electronic honestly look very chip very tinny pots, but for my surprise they work really!, really! good, so I have no plan to upgrade. I complete all the setup and the guitar sound incredible, is just crazy how good a guitar with this cost could ended sounding with only 3 simple modification. I am very happy with the outcome. The guitar sound better that two of my favorite $500 guitar, but painting is not 100% perfect and as a Novice a do some mistakes in the clear painting and buffing. if you ask me if I do this project again?, well I don’t know; the reason, I don’t have yet the space and the build and painting equipment to ended with a very profesional work but, if next time I decided to stain rather than paint for sure I will buy other Alder strat. 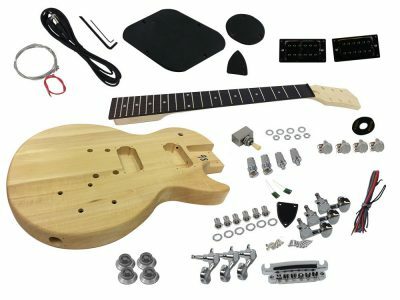 Overall I was planning to give 4 star review due a few of minor issues on the kit, I am giving it 5 star because, when I compare the service, solo help support, the quality of this guitar compared with other similar DYI models no one can bit Solo guitar. 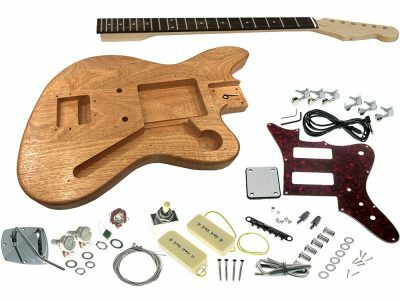 I have a $295.00 and I am including building and painting materials that sound as good of my $700 branded guitar so in my case, this was a wining project. I am being a little harsh with a 4. It is better than that. A 4.4 maybe. Neck and body are rough but in good shape. Sanding out, painting or staining and finishing are left to the buyer. This is great. Pieces feel like they are a little larger so you have room to sand and resand if needed. The electronics are good. While I haven’t finished this project I did install the guts and trem into another guitar and I like the sound. Impedance was about 5 ohms on the pickups. I don’t know what that means but Fenders are about 6 ohms impedance. 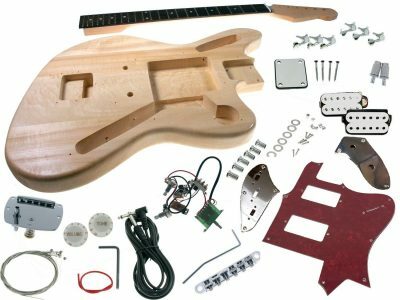 The pots and switch are stiff, which I prefer, and basic Chinese-made stuff like the pickups. Capacitors are installed on both tone pots. Wiring is clean and no frills. Like I said, it is a sound that I like and is hard to be judgemental about. It is your basic rock n roll guitar. But here is where I get picky. The pickguard was pre-installed. That normally would not be a problem. But I am using a different pickguard with American standard 11 hole spacing. Which is different from the pickguard in the kit. It is a nice pickguard. It needed a tiny bit of filing but came out nicely. So I filled those pickguard mounting holes in the body since my layout is slightly different. While doing this I noticed that some holes were a lot deaper than needed, like a full inch and a half deep. The trem. So it looks like a standard Fender trem but there are no holes dedicated to springs so I had to use the string holes. This can make pulling strings out and reinstalling a bit tricky with the extra metal. The trem and the saddles do what they are supposed to so that’s not a complaint. Maybe an fyi. And I took off the saddle springs. I think they are always too big. This is a 6-hole trem. I looked very close and ended up measuring the pre-drilled mounting holes very carefully. The low E side was about 1-2 mm off from the high e side. I filled those holes too. However, this could be a slight error in the trem location, which will require an mm or two of routing. Still, just a heads up. I think the screw holes were off rather than the trem slot. Either way the fix is really straight forward. The neck did not quite fit the shape of the pocket. So I shimmed the pocket with StewMac shims (1 or 2 mm thick maple) and dremeled the heel a bit. The pocket is super snug now and straight too. From measuring and comparing, the angle from fretboard to bridge is spot on, right out of the box. The neck has a tiny tiny twist to the nut on the high e side which is so small I expect it will disappear with strings installed. And I think the plastic nut would work but the string slots needed a better angle filed to acommodate the angle from nut to the tuning machines. I replaced the nut with a Fender metal roller nut. The body is heavy, cleanly routed and if my goals were different I probably would just sand and finish the neck and body and reassemble (though those tiny screw holes need a lot of protection from paint or gloss buildup…). The grain in the wood is nice too. There are a couple of very small natural voids in the wood but that will get fixed with a filler coat after sanding. As of today, I am at the sanding phase. I expect that to go well and after that I will dye and finish. Then electronics will go in. So far, the neck looks great and I am eager to see the finished product.